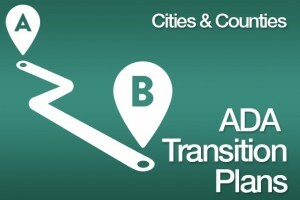 City and County ADA Transition Plans – Do you have yours? | ADA Compliance Consultants, Inc.
City and County ADA Transition Plans – Do you have yours? Think about the last time you walked down the street and crossed over several intersections on your way to a meeting at the building department or some other public agency building? Regardless of the public agency you sought to visit … no doubt you encountered barriers to access that impact the disabled every day. The agencies that require all of us in the private sector to comply with State access codes are also required by the Federal government to conduct transition plans and remove barriers within their own facilities and public sidewalks that access these buildings. Most of the articles I write each month deal with Title 3 — private property and public accommodation properties found in retail, office, light industrial and multi-family housing. This article highlights Title 2 — public agencies — and what law requires access to public buildings and programs! Access to civic life by people with disabilities is a fundamental goal of the Americans with Disabilities Act (ADA). To ensure that this goal is met, Title 2 of the ADA requires State and local governments to make their programs and services accessible to persons with disabilities. This requirement extends not only to physical access at government facilities, programs, and events, but also to policy changes that governmental entities must make to ensure that all people with disabilities can take part in and benefit from the programs and services of State and local governments. In addition, governmental entities must ensure effective communication, including the provision of necessary auxiliary aids and services so that individuals with disabilities can participate in civic life. Each city or county is required to conduct a self-evaluation of its buildings and programs and develop a transition plan. This plan is to be periodically updated as growth in the community occurs. The ADA requires public agencies with more than 50 employees to make a transition plan. Found in 28 CFR §35.150(d). Identify physical obstacles in the public agency’s facilities that limit the accessibility of its programs or activities to individuals with disabilities. Describe in detail the methods that will be used to make the facilities accessible. Specify the schedule for taking the steps necessary to upgrade pedestrian access to meet ADA and Section 504 requirements in each year following the transition plan. And indicate the official responsible for implementation of the plan. So how does this transition plan relate to a public agency’s transportation planning process? Any construction project that is programmed must meet accessibility requirements when built. Accessibility improvements identified in the transition plan that are not within the scope of an alteration project should be incorporated into the overall transportation planning process. This can be accomplished through the development of stand-alone accessibility projects. As a means to identify ADA compliance needs, during scheduling maintenance activities, the agencies should identify ADA accessibility needs and incorporate them into the overall transportation planning process. An agency’s transition plan should have been completed by January 26, 1992, and should be based on updates of the self-evaluation conducted to comply with the requirements of Section 504. 28 CFR §35.105. The plan should be updated periodically to ensure the ongoing needs of the community continue to be met. The transition plan should be coordinated appropriately with the STIP and the TIP. Changes to the plan shall be made available to the public for comment. The public agency should specifically target any local community groups representing persons with disabilities for comment, to ensure the agency is meeting the local priorities of the persons with disabilities in that community. The ADA deadline for completing the improvements listed in the transition plans was January 26, 1995. For those State and localities that have not completed their self-evaluation and transition plans, it is critical that they complete this process and get going on establishing a budget and making improvements. The exterior and interior accessible elements provided at public agency buildings must be made accessible to all disabled employees and the common public. An off-site path of travel connection to the public sidewalk to the on-site accessible walkway, which connects to the main accessible entry door. Accessible entry doors to the building with lever or loop style hardware, level 2% max landings on both sides of door and 32” minimum clear opening when door is open at 90 degrees. Accessible reception/ transaction counter that provides a clear 30” x 48” clear space at counter set at 36” wide by 34” max above floor surface. Accessible restrooms located along the accessible route. Too many things to list here, but let’s just say that if the restrooms only provide a semi-ambulatory stall and urinal rim set at 25” above floor surface, we have issues. Hi-low accessible drinking fountains if fountains are provided. A single high unit with a cup dispenser wall mounted is not acceptable. Accessible elevator or ramp system if building has two or more floors. This varies from building to building-based on programs provided. Accessible permanent room identification signs with braille mounted on strike side of door to each room at 60” max above floor surface. Accessible path of travel throughout each tenant suite to all conference rooms, break rooms and all common use rooms. Accessible point of sale machine/ device if provided. The third portion that public agencies must pay very close attention to is the communication with the disabled public during meetings or programs provided. The sight and hearing impaired are often ignored and denied equal access to government meetings and programs because the agency failed to provide adequate material in an accessible format. City governments often fail to provide qualified interpreters or assistive listening devices for individuals who are deaf or hard of hearing at public events or meetings. In addition, city governments often fail to provide materials in alternate formats (Braille, large print, or audio cassettes) to individuals who are blind or have low vision. As a result, individuals who are deaf or hard of hearing are unable to participate in government sponsored events or public meetings and unable to benefit from city programs and services when they are not provided with appropriate auxiliary aids and services. Likewise, people who are blind or have low vision are unable to benefit from city government services when printed materials are the only means of communication available. The requirement of Title 2 requires that city governments ensure that communications with individuals with disabilities are as effective as communications with others. Thus, city governments must provide appropriate auxiliary aids and services for people with disabilities (e.g., qualified interpreters, note takers, computer-aided transcription services, assistive listening systems, written materials, audio recordings, computer disks, large print, and Brailed materials) to ensure individuals with disabilities will be able to participate in the range of city services and programs. City governments must give primary consideration to the type of auxiliary aid or service that an individual with a disability requests. The final decision of course is the government’s. No matter how old a city or county is and what size and number of services and facilities they offer, every one of them is required to comply with Title 2 requirements. I must admit, I really enjoy working with public agencies that are serious about their access and want to truly identify barriers, produce a plan and start working it. It’s amazing the level of access gained when a proper budgeted plan is put into action. ← ADA Inspection: A 70-year old hotel vs. a 5-year old hotel.